This month Joe Egg hosts a club night dedicated to Billy MacKenzie. STUART ALEXANDER reflects on the enduring appeal of the former Associates singer. When I was in my early teens, I didn't often splash out on albums, preferring instead the disposable pop thrill of the seven-inch single. But I had to buy The Associates groundbreaking album Sulk on the day it was released. I remember sitting on the back seat of the bus, sniffing the vinyl in anticipation. I was not disappointed. I played that album non-stop For months - much to my parent's chagrin. It was the most dazzling, vivid music I had ever heard; lush, romantic, and wholly inspiring, and I was totally bewitched by the seductive voice of the singer with the cheeky dimpled grin, Billy MacKenzie. Sulk was essentially a pop album, but there was something far more compelling about The Associates' sound which set them far apart from their contemporaries. And although they broke through at the same time as pop's "Gender Benders" (and Billy's bisexuality was widely known), The Associates were one of music's great genre benders - anticipating the adventurous Electro-soul of artists such as Bjork or Massive Attack by a whole decade. During the summer of '82, Sulk managed to change my entire perspective on music, and Billy MacKenzie, who grew up in Dundee - just 10 miles from where I lived - gave me hope that I, too, could break away from the drab conformity of Scotland's East coast. I threw myself around school discos to the follow-up hits, Club Country and Love Hangover, dreaming of my own escape, aspiring to something altogether more glamorous. 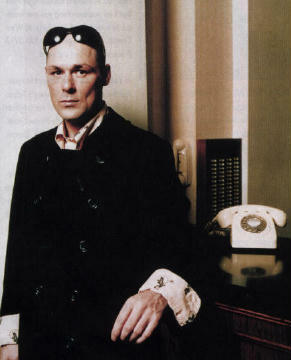 Billy MacKenzie's increasingly high profile soon gained him a reputation within the industry as a prankster, squandering large amounts of record company money on impulsive gestures - at one point he owned a fleet of classic cars, an extravagance unhampered by the fact that he couldn't drive. Perhaps, the ambitious follow-up to Sulk, took three long years to record, at a cost of £250,000 (which was a lot of money in those days), but sold poorly. Warners tried to rein in their uncontrollable artist, but working within commercial constraints proved too much for a free spirit like Billy. While he continued to spend, spend, spend, releases were few and far between, delayed or scrapped altogether. He was dropped From Warners in 1989, with only a handful of songs released post-Perhaps, some in collaboration with Yello - a high point being The Rhythm Divine, recorded with Shirley Bassey. An album, The Glamour Chase, containing some of Billy's Finest work, remains unreleased. In the early Nineties, Billy recorded two more albums, with some great songs suffering under jarring, ineffectual production. Increasingly frustrated fans deserted him, record sales dwindled and Billy once again found himself without a contract in 1993. But throughout all these ups and downs, one thing remained constant: Billy's glorious voice, although by now his brazen histrionic singing style had matured into a sublime and soulful croon. Between then and his suicide in 1997, he continued to make some breathtaking music, undaunted by frugal recording circumstances - perhaps relishing a return to the pre-Sulk days of The Associates, when enthusiasm would triumph over lack of funds. He left us with a surprisingly expansive legacy of unreleased music, the posthumously released album Beyond The Sun hinting that the best was yet to come. Now, nearly three years after his death, there are websites, fanzines and a 300 page biography dedicated to his mercurial talent. There are plans for a TV documentary about his life, whilst three CDs of unreleased material, as well as re-issues of some classic Associates' albums, will appear this autumn. Joe Egg has organised a club night, Groovin' With Mr MacKenzie, which will play some of his finest work against a backdrop of videos and film of the extremely handsome Mr MacKenzie. The reason for this enduring interest is simple. Billy MacKenzie was one of the greatest soul singers the late twentieth century has produced, outstripping his peers by octaves. After Sulk, I always expected Mr MacKenzie to achieve greater success with each subsequent release. Unfortunately, it didn't happen that way. While artists such as Morrissey achieved dizzying success, Billy was increasingly sidelined, too dignified to be a media whore. "There is no other singer or songwriter that I can think of who has been so criminally neglected by both the pop audience and the critics," says Joe Egg. "There were a scattering of glowing eulogies in the press after his death, but, like many people, I'm still left frustrated at how his post Top of the Pops career has been overlooked. A good Billy MacKenzie song, like a good Scott Walker or Morrissey song, can make everything else in the world seem rather tiny and inconsequential. Groovin' With Mr MacKenzie, The Paradise Bar, 460 New Cross Road, London SE14,Thursday 14 October, 9pm until lam. Tickets £4. Details: 0181 694 1376.